Milton Erickson’s quotes have motived a lot of people around the world. He was an American psychiatrist who was noted for being self-taught despite being dyslexic. He rose from modest beginnings, overcoming his dyslexia and a severe polio affliction, to become a respected psychiatrist and founding President of the American Society for Clinical Hypnosis. "Life will bring you pain all by itself. 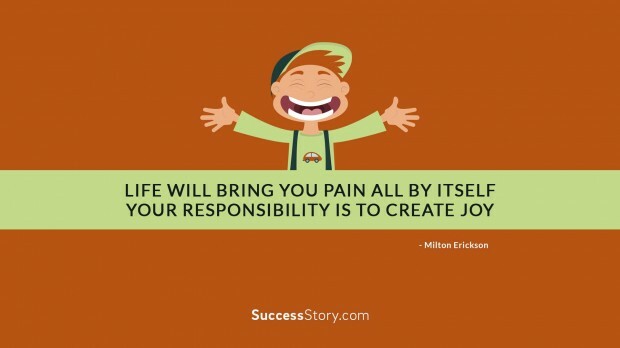 Your responsibility is to create joy "
Milton went on to make significant contributions in the fields of family therapy and psychotherapy in general, writing several books and clinical essays in the process. He introduced new techniques, most notably hypnosis as a form of therapy. His life therefore complemented his quotes, which not only addressed his areas of expertise but also life in general, and were often motivational. He believed in taking control of our lives, as the decisions we make often influence the direction of our lives. For instance, while we cannot control what life might sometimes bring us, such as pain, we can be positive and create joy around us. He also believed that each person is unique, and therefore we should be sensitive to how we relate to them, whether during psychotherapy or in social interactions. Milton Erickson’s life was as motivational as were his quotes. He showed that it is possible to overcome physical handicaps, in his case dyslexia and polio (in his later years, polio also confined him to a wheelchair), to pursue our dreams and at the same time make a positive difference in the lives of other people.